Carroll Shelby died just over four years ago, but he left a legacy that continues to this day. Best known for his work on the Shelby Cobra and an association with Ford that resulted in high-performance Shelby Mustangs in the late 1960s and 2000s, Shelby forged a path for himself that also included some lesser known automobiles. Some of the other projects that bore his name happened in the 1980s and were questionable at best. We can’t deny, however, that Carroll Shelby changed the face of the automotive landscape and set the bar for high-powered muscle cars to this day. We think of the Dodge Charger and conjure images of the tire-roasting 1960s beasts or the slightly more refined modern 4-door sedan. We tend to forget that the 1980s saw the brief return of the Charger name, which was affixed to higher-performance versions of the front-wheel-drive Dodge Omni. Starting with the Charger’s 2.2-liter four-cylinder engine, the Chrysler Shelby California Development Center in Santa Fe Springs, California, bumped compression up to 9.6:1; added a slightly hotter camshaft; opened up the exhaust for better breathing; and retarded cam timing by four degrees to aid top-end performance. The net result was an increase in output to 107 horsepower and 127 pound-feet of torque, and with the aid of a close-ratio five-speed transmission, the Dodge Shelby Charger could run from 0-60 MPH in 9.0 seconds on the way to a top speed of 117 MPH. The quarter mile went by in 16.8 seconds, at a speed of 82 MPH. By today’s standards those are hardly impressive numbers and are even matched by the base Corolla. Production ended in 1987, at which time the Shelby was Dodge’s highest-performing vehicle. What do we have here? This could be one of the world’s first performance pickups. Shelby attached his name to about 1,500 Shelby Dakotas built for the 1989 model year. What made these trucks different from their non-Shelby brethren? The Shelby truck used the 5.2-liter V8 from Dodge’s full-size trucks in place of the standard Dakota’s V6. Aside from a fiberglass light bar and some fancy paint, there weren’t any other major upgrades of which to speak. 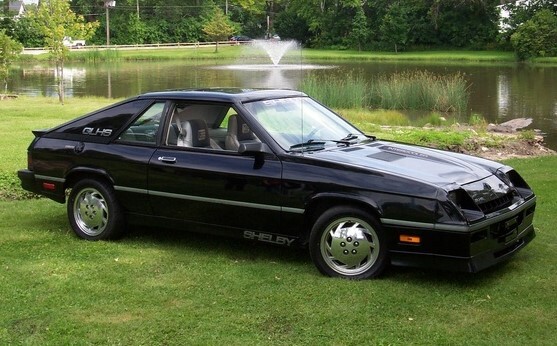 Still the Shelby Dakota is a piece of 1980s nostalgia that remains a rare find on the used market. The Shelby Lancer continued the tradition of the Shelby Charger. The Shelby-tuned 2.2-liter turbo engine produced 175 hp and completed the 0-60 mph sprint in 7.2 seconds and the quarter mile in just over 15 seconds. If you ever see a Dodge Lancer Shelby, count yourself lucky. Rare when new, they are positively unknown, unloved, and non-existent now, which is a shame. In the late 1990s, Shelby wanted to return to his roots and design a successor to the infamous Shelby Cobra. Design work began in 1994 and promised a carbon fiber body, a rear-mounted Corvette C5 transaxle, a total weight of 2,650 lbs, and 500 hp. By the time the car was finished it weighed nearly 3,000 pounds and was powered by a V8 out of an Oldsmobile Aurora. That was still good enough for 320 hp and a 0-60 spring of 4.4 seconds. Only 249 cars were produced in 1999, after which the car was sold as a kit to avoid an expensive Federal Motor Vehicle Safety Standards certification. The Series 1 is the only car ever designed and engineered by Carroll Shelby and built from the ground up. All other Shelbys are re-engineered models produced by other manufacturers and modified by Shelby. Which Shelby car would you most want to take home? This entry was posted in Car Minded, Classic & Vintage Cars, Domestic Cars, General Chat, United States and tagged Carroll Shelby, dodge shelby charger, forgotten shelby cars, shelby, shelby dodge. Bookmark the permalink.